SEBI’s contention has been, and rightly so, that this classification gives greater clarity to the mutual fund investors about what is the investment portfolio that they are investing in. The new mutual fund categorization norms announced by SEBI call for reclassification of schemes by all the mutual funds. Before getting into the nuances of the reclassification, let us understand the logic behind this move. Indian mutual funds offered over 2,000 mutual fund schemes across 40 AMCs. Each scheme had a direct plan and a normal plan and each plan had a dividend option and a growth option. For a mutual fund investor, this was just too confusing. Moreover, the larger AMCs with more than Rs.200,000cr in AUM would have multiple equity schemes with different names but the same structure. This made the choice tough for the mutual fund investor. As shown in the classification chart, SEBI has defined 10 categories for equity funds, 16 for debt funds, 6 for hybrid funds and 2 for special situation funds. While hybrid funds combine equity and debt, the special situations funds offer goal-based solutions for retirement planning and for creating a children’s fund. Each AMC can only have 1 scheme under each of these 34 categories shown in the chart above. However, there is a fifth category “Others”, which will consist of all other funds like index funds, ETFs, gold funds, Fund of Funds etc. Funds can have any number of schemes under this category. SEBI’s contention has been, and rightly so, that this classification gives greater clarity to the mutual fund investors about what is the investment portfolio that they are investing in. The communication is much clearer to the investor and comparison across funds becomes more meaningful. How does SEBI reclassification improve the investor’s understanding of what they are getting into? The new classification will call for a consolidation of funds and also change in nomenclature. For example, the name of the fund will have to be determined by the asset mix. A fund that has over 90% of its portfolio in index stocks will be classified as an index fund. So, a diversified equity with over 90% exposure to index stocks will now be classified as an index fund. An equity fund will be given the tag of “large cap” or “mid cap” based on the proportion of respective holdings. SEBI has also clarified on the definition of large caps and mid caps. Instead of going by absolute cut-offs, the listed companies will be ranked by market cap. The top-100 will be large caps, the next 150 will be mid caps and the remaining stocks will be small caps. 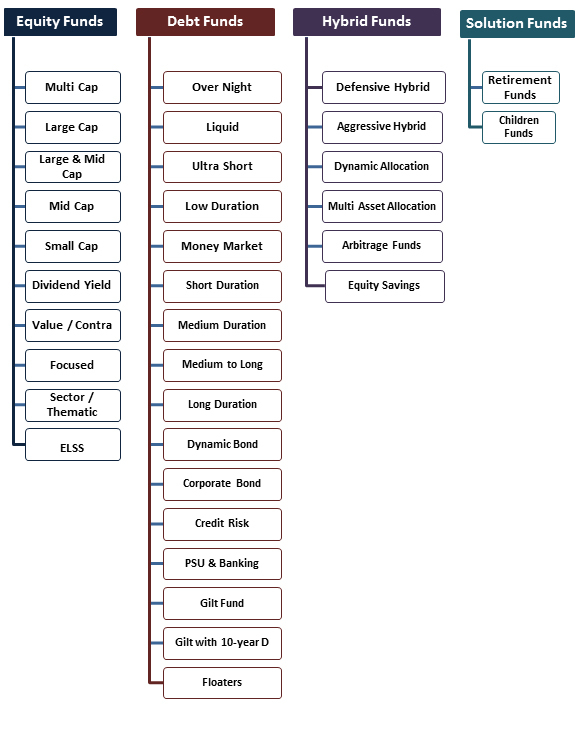 This makes comparison simpler across fund categories. SEBI has clearly defined themes like Value, Contra, Sectoral etc and each AMC can only have one fund of each of these categories. For the investor and for financial advisors, the job becomes more structured. Debt fund categorization will now have to be done based on the duration of the portfolio or the credit quality. On the basis of duration, you have a complete range from overnight funds to 10-year funds. The other criterion for classification is credit quality. You can have funds like credit funds, gilt funds, corporate bond funds and dynamic funds where the name of the fund describes its nature and objective clearly. While debt fund investors are normally the savvy corporates and HNIs, financial advisors will be more confident recommending debt funds to their retail investors. Here again SEBI has focused on removing the ambiguity. There is no confusion over balanced funds and MIPs. The hybrid fund will either be an aggressive hybrid fund or a conservative hybrid fund and the name will be enough to indicate the mix of debt and equity. Cash-futures arbitrage funds will also be classified as a hybrid fund only. This removes most of the grey areas surrounding hybrid funds where the nature of the mix is critical and whether the strategy is clearly defined as static or dynamic. One can argue that post reclassification, the number of schemes has not reduced substantially, but that is off the point. What matters is that a step has been taken towards standardizing definitions, classifications and nomenclatures. Small investors will now have much greater clarity when they are investing in equity, debt or hybrid funds. Fund nomenclatures will actually reflect what the fund composition is. For financial advisors, the task of tagging funds to goals becomes a lot easier and even benchmarking becomes sharper. This could also be a big boost for the Do it yourself (DIY) investor depending largely on online and robo advisory. But above all, the mutual fund investor will finally be on WYSIWYG (What you see is what you get) mode!